This is a great dish to serve midweek with grilled steaks, fish or chicken. Two-thirds of the prep time is marination, allowing you to do other things while the radicchio absorbs the sweet-sour dressing that complements its natural (and healthy) bitterness. Peel and crush the garlic then put it in a large bowl. Add the olive oil, honey. lemon juice and some salt and pepper and whisk to combine. Depending on its size, cut the radicchio into halves or wedges, ensuring that each piece has a bit of core to keep the leaves together. Add the radicchio to the bowl and turn gently to coat thoroughly with the marinade, using a spoon of brush to help you if preferred. Encourage the flavourings to trickle down between the layers of leaves. Set aside to marinate for at least 20 minutes. 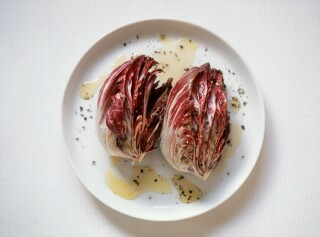 Arrange the radicchio on a grill pan and grill on each side for 2-3 minutes until lightly charred. For a different tangy top note, replace the garlic with a teaspoon of freshly grated ginger root.